Order one size up for an oversized fit. Please note: the loved patch on the front pocket will be in gold as shown in the photo. We can no longer source this in red. 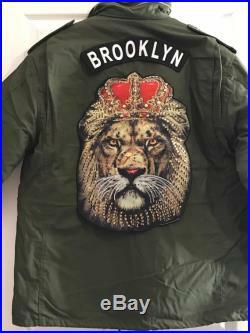 Vintage or new military jacket jackets runs big (mens sizes) four pockets long sleeve may show evidence of patch removal some jackets may be darker in color- -measurements- extra small (xs men's' / small women's) length: 25 / 64cm sleeves: 21 / 53 shoulder to shoulder: 16 / 41cm bust: 40 / 102cm waist: 38 / 94cmsmall (small men's / medium women's) length: 27 / 68cm sleeves: 23/ 58cm shoulder to shoulder: 18 / 46cm bust: 44 / 102cm waist: 40 / 101cmmedium (medium men's / large women's) length: 28 / 71cm sleeves: 23 / 58cm shoulder to shoulder: 19/ 48cm bust: up to 46 /117cm waist: up to 43 / 109cmlarge (large men's / xl women's) length: 32 / 81cm sleeves: 24 / 61cm shoulder to shoulder: 20 / 51cm bust: 52 / 132cm waist: 50 / 127cmextra large (xl men's / xxl women's) length: 34 / 82cm sleeves: 26 / 62cm shoulder to shoulder: 24 / 61cm bust: 54 / 137cm waist: 53 / 131cmcondition: new or good vintage, subtle natural weardry clean only. Machine washer/dryer will damage the embroidery.